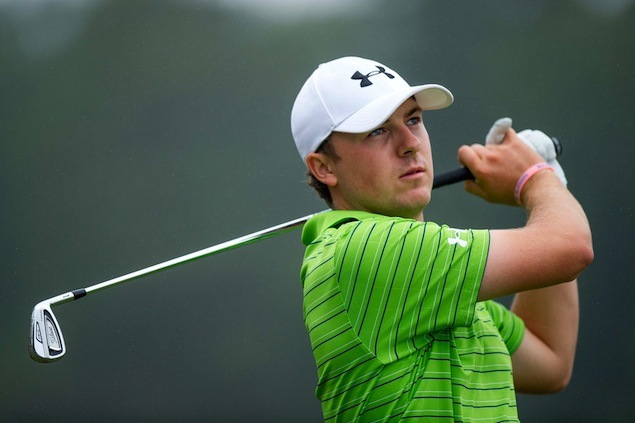 Ruthless Golf: Is Jordan Spieth the Next Sergio? It's one of the more interesting discussions engendered by the Masters: Is Jordan Spieth the "next big thing" or will he struggle the way Sergio has? I thought it was a bit strange that Jordan took so much flack for his emotional outbursts during the final round Sunday. Some people were apparently very offended because Jordan had a few minor "displays" when everything went wrong for him. I couldn't help but wonder why other players (Tiger comes to mind) don't get the same treatment when they drop the F-bomb -- very loudly -- because they had a bad lie in a bunker. And as I recall, Henrik Stenson's little tantrum during the FedExCup Playoffs last year was actually considered comical. Remember this one? But perhaps this is part of what originally spawned the question. I first heard it when Frank Nobilo brought it up on GC's aftergame show. And I suppose it's a fair question, given the expectations being heaped on Spieth so early in his career. You can certainly draw parallels between Jordan's performance at the Masters with Sergio's 1999 PGA performance at Medinah. The comparisons are equally glowing, as you can tell from this golf.com article reprinted from the Aug. 23, 1999 issue of Sports Illustrated. Sergio could do no wrong back then. The question is, what happens if Jordan suffers Sergio's fate and that first major doesn't come quickly? Isn't it possible -- even likely -- that Jordan's rosy future may get derailed? Yes, it's possible... but I do think there's one major difference that's not being taken into account here. It's the very reason for this debate. Let's call it "the Tiger Effect." At the time of his PGA win, the Tiger legend was still in its infancy. He had won a lot but the PGA was only his 2nd major and he hadn't even won his first WGC yet. (That happened a month and a half later.) The PGA was his 11th win in roughly 4 years, and he was just halfway through the first of those years with 8+ wins. As spectacular as he had been, we still hadn't seen Tiger in full flight. And certainly 19-year-old Sergio had never seen, perhaps even imagined how a player could be so dominant. The full Tiger Effect demoralized most Tour veterans and destroyed a few more, let alone an impressionable young player trying to copy his idol Seve. But now, 15 years later, youngsters like Jordan Spieth have grown up with the Tiger Effect. They've grown up with weight training and sports psychologists and media advisors... and million dollar winner's checks and multimillion dollar endorsement deals. Consider this: Tiger's 12-tournament maiden season of 1996 (which included 2 wins and 4 other Top5s, plus an extra Skins Game appearance) netted him a mere $790,594. By comparison Tom Lehman, that year's money list winner, played 25 events (plus 3 unofficial) and won 2 tournaments including the Open Championship plus 7 Top5s. He took home $1,780,159. My point is that young Jordan's world is much different from that of young Sergio. Jordan's expectations have been shaped by the superhuman performances of one Eldrick Tiger Woods. He knows what is possible... and, by extension, how devastating failure can be. He's been preparing for both. It seems a little naïve to assume that Jordan is likely to react the same way to adversity as Sergio did. The "brave new world," the "paradigm shift" that Sergio faced is just the "way things are" for Jordan. So while I suppose Jordan's career could end up being a bust... I sure wouldn't bet on it. Your joking right? When Tiger swears or shows his emotions too aggressively they not only comment about it, they repeat it. I think your memory or reporting is either false or selective.